Sunnyside Little Chapel of the Chimes honors the many caregivers, hospice and palliative care professionals that care for our families during such a difficult life transition. In recognition of Hospice and Palliative Care Month and the selfless care provided to the many families that seek care services, we cordially invite you to attend an appreciation luncheon. 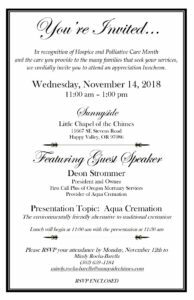 Our event will feature a beautiful lunch buffet provided by Epic Catering and an informational presentation from Deon Strommer, President and Owner of First Call Mortuary Services who now provides families with Aqua Cremation, an environmentally friendly alternative to traditional cremation. Join us for lunch and this amazing presentation with a dedicated Q&A opportunity. Come learn how the death care industry is evolving to better serve families.